Pastor Rob Bell’s best-selling book Love Wins has come and gone despite being plastered on the front cover of Time Magazine in April 2011. 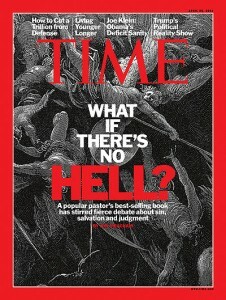 The focus of the dilemma raised by Bell, pastor of Mars Hill Bible Church in Grandville, MI, is whether hell is a real place and is God going to “send anyone to hell” in the final scheme of things. 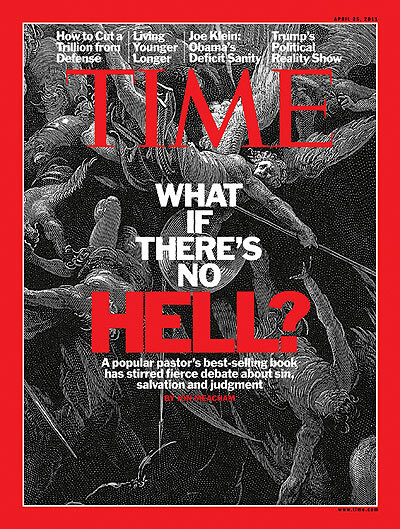 Bell’s controversial views attracted the hearts of people who would rather not think about hell and their eternal destiny and just hope for the best when it comes to the afterlife. In addition, Love Wins caused an upset among evangelical Christians who believe the pastor is denying the fundamentals of traditional Christian doctrine. Samaritan’s Purse President, Franklin Graham even went so far as calling Bell a “heretic and a false teacher” on FOX-TV’s Bill O’Reilly show. Though the heart of the conflict is no longer in the lens of the media, Christians cannot allow Bell’s denial of Christian truth to be ignored. However, the real controversy is not about Bell’s view on hell, but rather on his teaching on salvation. In his book Bell asks a series of rhetorical questions that would ordinarily come from a fifth grade student inquiring about God’s fairness. In today’s blog, I’d like to respond to some of Bell’s juvenile questions. If someone knew nothing of God’s character, then Bell’s question is quite understandable. Most people without much exposure to Christian theology may assume God’s only attribute is love and that all His actions must be loving. Bell’ s view of God is self serving since He sidesteps the other attributes of God that contradicts his view of God as loving. Why would a loving God “send a person to hell?” Bell asks. In Bell’s view, one wonders if God is holy and does He bring man to a bar of eternal justice, or does God look the other way at man’s sin? In Bell’s thinking this passage should read, “Yet to all who did receive him, to those who believed in His name, he gave the right to become children of God, and to those who do not receive Him, they become the children of God anyway.” After all, how could a “loving God” not make every one of His creation, His redeemed children as well. What is the point in believing in Jesus for salvation, if God’s love is so vast that those who don’t believe in Jesus go to heaven as well? Do we have to believe the gospel message or can we believe anything we want and still end up in God’s presence for all eternity? On page 5 of Love Wins Bell appears to be mocking “the sinners prayer” or the idea of “accepting Jesus to be saved” or being “converted.” Perhaps the words we use to describe how we enter into a relationship with God are manmade. Big deal! The word “trinity” is not found in the Bible. Does it mean the Scriptures don’t teach the tri-une nature of God? Even if the sinner’s prayer formula is not found lurking in the pages of the New Testament, the truth behind them is real. Listen to Paul in Romans 10:9-11: If you declare with your mouth, “Jesus is Lord,” and believe in your heart that God raised him from the dead, you will be saved. For it is with your heart that you believe and are justified, and it is with your mouth that you profess your faith and are saved. As Scripture says, “Anyone who believes in him will never be put to shame.” How else can we understand Paul’s words? Of course, as Bell questions, the person who simply utters some form of “a salvation prayer” at some crisis point in their lives, and then goes on living as though Christ means nothing is not covered by merely uttering the words of this prayer. Jesus clarified this issue in the Parable of the Four Soils (Matthew 13:1-9, 18-23). Only in the heart or soil which receives the gospel message/seed with commitment and allows the word to take root in their lives is the one who is saved. In Matthew 13:23 Jesus describes this person: “this is the one who hears the word and understands it, He indeed bears fruit . . . ” An emotional response to the gospel in a Kumbaya moment besides the glowing embers of a youth meeting campfire is not a true indication of a “good soil” where the word of God is planted. Bell tries to argue the point that Christians believe, “so is it true that the kind of person you are doesn’t ultimately matter, as long as you’ve never said or prayed or believed the right things?” (Love Wins, pg. 6) Of course, the only Christians that believe this way are believers ignorant of the Word of God. Strangely, Bell doesn’t attempt to refutes the arguments he raises by responding to them with Scripture. He’ll raise the issue of so-called followers of Jesus who have faith, prayed or believed the right doctrine but never did anything afterwards. A knowledgeable pastor would quickly point out from James 2:14-26 that “words of faith in the sacrificial death of Christ” are useless if there are no “works resulting from that faith in Christ.” Why is the world can’t Bell put on his pastoral thinking cap and respond with scripture to such common issues? It’s almost as if Pastor Bell wants nothing more than to raise doubt and uncertainty about the truths of the Bible. I’m not sure of Bell’s motives in writing this bizarrely written treatise on the “fate of every person who ever lived.” For the sake of the readers of ScriptureSolutions who need to read and hear a clear presentation of the good news of the Lord Jesus, this series will continue.